Red circles show the location and size of marine dead zones worldwide. Black dots indicated observed dead zones, but their size is not known. The world’s oceans are exploding with dead zones, regions where the water is so depleted of oxygen that fish and other sea life that live near the bottom cannot survive. Dead zones are human-caused. They occur when crop fertilizer and cow poop, containing high levels of nitrogen and phosphorous, get washed into streams and rivers and out to the ocean. The nutrient-rich farm runoff triggers huge algae blooms. When the algae dies, it sinks down to the bottom of the water. Bacteria living in the water decompose the dead algae, and use up the oxygen. Without enough oxygen in the water, fish and shellfish suffocate and die. The number and size of marine dead zones has doubled each decade since the 1960s, mostly due to agricultural pollution, according to study published in the journal Science. They are concentrated on the East coast of the U.S. and Europe. Declines in oxygen are associated with an expanded use of industrial nitrogen fertilizer, especially in the 1960s and 1970s. The impacts of these fertilizers, however, were not observed until at least a decade later. 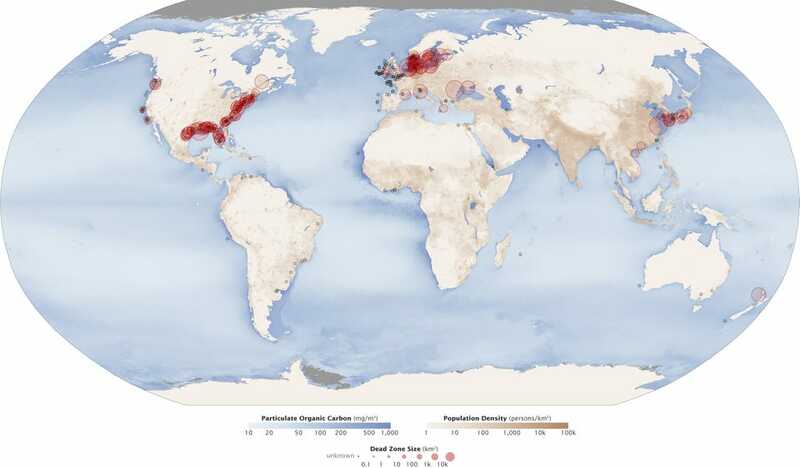 In 2008, dead zones affected more than 245,000 square kilometers of the planet’s ocean, an area approximately the size of the United Kingdom. A dead zone, shown in red, forms each summer in the Gulf of Mexico. Fish and shellfish either leave the oxygen-depleted waters or die, resulting in losses to commercial and sports fisheries. 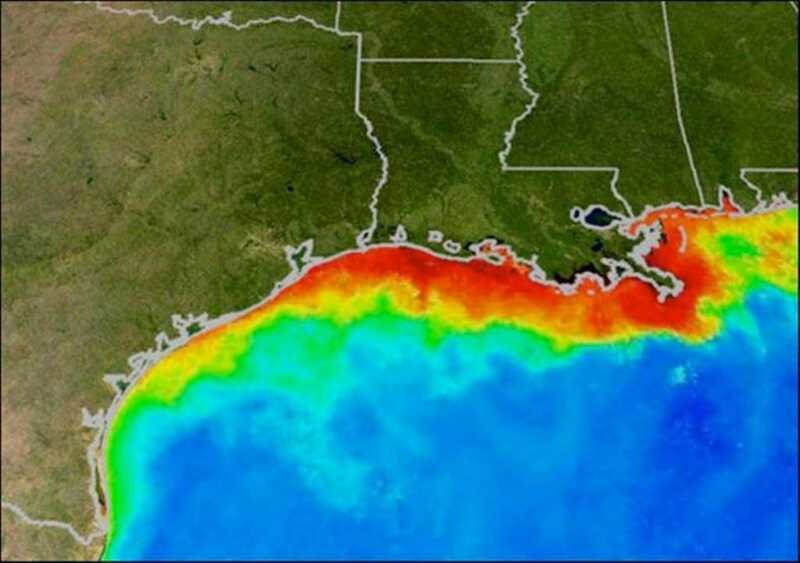 This summer, researchers predict that the the Gulf of Mexico will be strangled by one of the largest dead zones on record. The oxygen-deprived area could cover an area roughly the size of New Jersey, according to a statement from Michigan University. Floods across the Midwest are blamed for this year’s potentially record-breaking dead zone, which shoot nitrogen-rich freshwater from the Mississippi River into the Gulf of Mexico. The amount of nitrogen entering the Mississippi has jumped 300% since the 1960s, regardless of especially heavy rains this spring. Dead are zones are not visible — you can’t see a decrease in oxygen — but their existence endangers all marine life on the seabed, and therefore, the commercial fisheries that depend on creatures like fish, clams, and shrimp to stay in business.